Another small happy is for my local libraries! I was able to track down not only a copy of the next Dark Tower Series books, but the one that follows after it as well! I'm all set for reading material for another couple of weeks! I find socks intimidating! AND you're doing some amazing cables? You're a knitting prodigy. 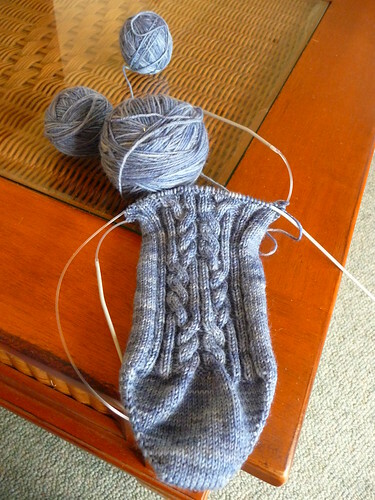 :D The whole picking up stitches with knitting thing freaks me out so shaping the socks would be impossible for me. I can do it with crochet since I just generally find crochet more intuitive (and harder to hopeless biff up) but I guess crochet socks aren't too comfy. And HOORAY for finding the next DT books. Hehehe, socks really shouldn't be that intimidating; and cables are easy-peasy! Trust me! That's so funny you think that way; I am SO GOOD at biffing up crochet; all of my attempts to try it so far have ended in knotty disaster! This does remind me that I really should do some research into non-animalwool sock yarn, I have such a preference for beautiful wool yarns I can't think of any off the top of my head!